Summary: Kicked out of his orphanage after its supplies are ravaged by a wild tiger, and on the verge of starving to death, as well as having recently ran for his life from that same Tiger in the middle of a city...Nakajima Atsushi meets some strange men. 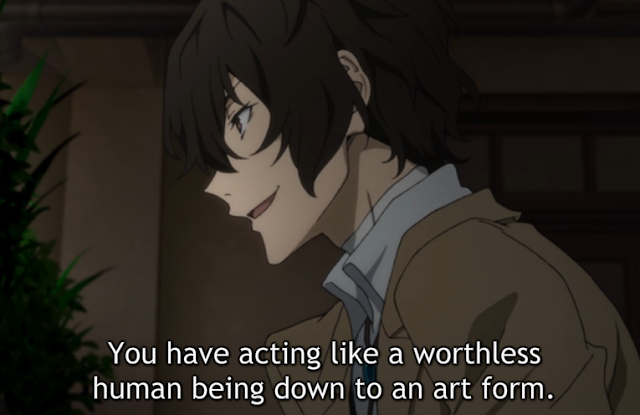 One of them, Dazai Osamu, is a suicidal man attempting to drown himself in broad daylight. The other, Kunikida Doppo, nervously stands by obsessively flipping through a notepad, and trying to keep tabs on Dazai. Both are members of the "Armed Detective Agency" said to solve incidents that even the military and police won't touch. Atsushi ends up accompanying them on their mission to eliminate the tiger that's been terrorizing the population, as they take a keen interest in noting that the Tiger is following him, even though he himself hasn't noticed it yet. First Impression: Comedy. I have seen nothing but comedy. Even when it tried to get properly serious in the second episode, I saw through it for what it actually was. Still, it tried. My Opinion: Well. Right now it's still just introducing its main cast, and it has several more characters and powers to make a show of based on the lineup presented in the first episode. Interestingly enough, the show enjoys taking a moment to flash on screen every characters power when they are introduced, but...only the name. I...actually kind of like this. The name implies a vague idea of what the power might do, but it still leaves it up to the viewer to try and guess what it will actually be like. Over all, the show has a very strange feel to it. I can't really grasp what the core of the show is going to be. Certainly, there's a hefty dose of comedy, and even some...mystery? But it doesn't really seem to focus on that. Also, for all the large flashy animations attached to the powers, the actual use of them is...extremely brief. Same for the action scenes. Maybe it's just because the show is still introducing everyone, and trying to get the viewer to connect to them. For now, the show has my curiosity well in hand, despite that nothing has really stuck to me, other than how weird they're making their characters out to be, psychologically. That's something I want to point out, the show makes a point of explicitly saying something along the lines of, "all power holders have something twisted in their minds/personalities". I think more than anything else, that got my curiosity the most, the promise of an entire main cast with psychological issues to define their characters and personalities, instead of the usual checklist of anime character tropes. But, well, it could still just become that in the end. We shall see.